Only the KDT-655 Neural-Flex Technology maintains an axial pull vector while allowing the patient’s lower torso to be dropped into deep flexion. The flexion caudal section is fully powered for effortless transition to the pain relieving position. 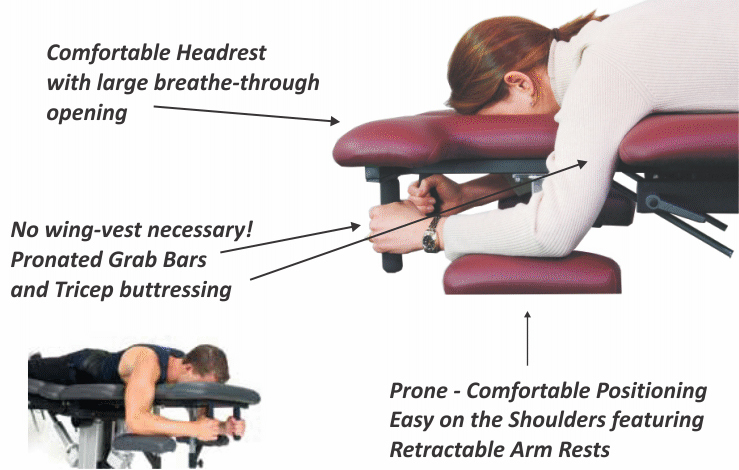 The KDT-655 Neural-Flex Table is the first Decompression Table which adds the capability of advanced treatment of nerve and foraminal encroachment syndromes as well as a new option for patients suffering with spinal stenosis. Only the KDT-655 Neural-Flex ® Technology maintains an axial pull vector while allowing the patient’s lower torso to be dropped into deep flexion. The flexion caudal section is fully powered for effortless transition to the pain relieving position. Armedica KDT-655 Neural-Flex ® Technology can be used for traditional manual flexion mobilizations as well. Bolster-less leg elevation with Pelvic Tilt which pretensions posterior elements. Simultaneous patient and table Y-Axis distraction. The Passive Tensioning Reactive Orthopedic Spring controls X-Axis Table motion. Enhance decompression without added force. Tension can be matched to patient morphology. Lateral motor mount slide allows lateralization of pull for lateral hernia, scoliosis, and facet syndromes. Effortless prone positioning. Retractable/Adjustable arm rests; pronated grab bars and arm butress eliminates slippage without he need for a wing vest.